All transactions are safe and secure with a reliable history in online purchasing behind each of our associates. 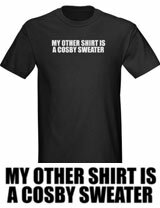 Buy the My Other Shirt is a Cosby Sweater t-shirt to own Cosby Show clothing and merchandise. If you have nothing but love for the The Coz and his Coogi sweaters then this Cosby Show shirt is right up your alley. It will remind you of the good times eating bacon burger dogs, lip-synching old tunes to the grandparents and dancing around to the greatest elevator music I've ever heard. Another notable piece of clothing on the show was Theo's Gordon Gartrelle shirt. Be sure to check out our tee version of the infamous Gordon Gartrelle original. In addition to the My Other Shirt is a Cosby Sweater tee above, browse the Cosby Show Clothing Gallery for more apparel like men's and women's clothes, kids shirts or hoodies.